A pair of plucky Americans saves the Vatican from itself in a thriller long on pages and short on probability. Harry Addison, a successful young Hollywood entertainment lawyer, finds a message on his answering machine that unsettles his well-ordered world. It’s from his brother, Vatican priest Father Daniel Addison—the brother Harry hasn’t spoken to in eight years or seen in ten. And yet the message is a plea for help: —I—m scared,— Daniel says, without specifying why. A day later, before Harry can respond, Daniel’s killed in a bus explosion. The circumstances are mysterious, and when Harry goes to Rome to claim the body, he’s further shaken by what he learns: (1) that Daniel was the leading suspect in the assassination of a Vatican cardinal, one of the pontiff’s inner circle, and (2) that he himself is being fingered as an accomplice. 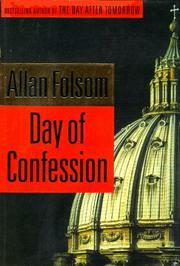 It’s at this point that Folsom’s imagination overheats and things go haywire in the Grand Guignol manner. As a sampling of shocks and horrors, try these: a Vatican cardinal who’s a megalomaniac and another who’s a murderer; a nun whose concupiscent fantasizing foreshadows the rescinding of her vows; a Vatican-inspired conspiracy aimed at bringing China to its knees as a first step toward restoring the Holy Roman Empire. Or how about the top Vatican cop hiring the world’s most deadly terrorist? Object: the systematic elimination of anyone who endangers the conspiracy or even gets a sniff of its existence. And, finally, there’s the high-tech firefight in Vatican City during which dead bodies pile up faster than papal bulls used to and our heroic Hollywood entertainment lawyer outperforms Rambo. Second-novelist Folsom (The Day After Tomorrow, 1994), who seems to have a penchant for overstuffing novels, buries an interesting, at times poignant, fraternal relationship beneath a paper avalanche. In suspense fiction, less can be more.